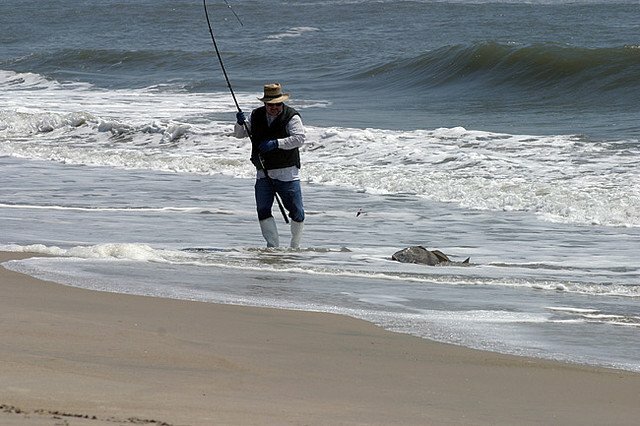 Surf casting is one of those fishing pursuits that comes with a whole lot of mystery. How can any fish find that lure in all that whitewater? So when something catches your line, it can be an absolute surprise. And you never know what you’ll get. Sharks, salmon, and drum are just a few of the powerful fish surf anglers may wind up fighting to the shore. But it takes more than just arming yourself with surf gear and heaving a lure into the waves. Surf fishing involves wading into the surf, or standing on the shore, and casting out into the tide. Here are four helpful tips. Showing up to the beach and hoping for the best is not a plan of attack. Talk to any experienced surf angler and they’ll tell you how important it is plan your outing in detail, including your location, the best baits to use, and the best times to hit the shore. Don’t forget to contact local bait and tackle shops for firsthand knowledge of the area’s fishing. It takes time and experience, but being able to visualize what’s going on beneath the water’s surface and understanding how factors other than the fish come into play will lead to success. Keep an eye out for movement, including ripples or dark masses that belie the location of a fleeing school of baitfish, or the presence of birds situating over a specific spot. Also, keep in mind that wind can be your best friend, as winds coming off the water and onto the beach will often push baitfish into the surf zone, where gamefish follow. Serious accidents can happen without warning on the water, especially in saltwater where hazards like jellyfish or sharks lurk. When you’re surf fishing, be sure to pay attention to your surroundings at all times. Factors like shifting sands resulting from storms, or dangerous waves striking a jetty, can spell disaster if you’re not cautious. Wade carefully, rather than simply plodding ahead, and be sure to take it slow. Shuffle your feet laterally as you move instead of taking big, blind steps. Wading slowly also reduces the risk of spooking fish. To handle the strong waves and mighty fish, you’ll need to arm yourself with a sturdy surf rod (12 to 15 feet with big line guides), a sand spike (usually a length of sharpened PVC stuck in the ground to hold your rod), tough line (20 to 25-lb test) and hooks to hold up against teeth and power, and a mix of lures and live bait. Spoons, topwater plugs, or artificial plastics can be deadly, as can bait such as cut baitfish, crabs, or sand fleas. You can also use a casting net to catch your own bait if you don’t want to pay for it.